Synopsis: Jubilee Chase and Flynn Cormac should never have met. What I Thought: OH MY LORDY. So so good. The FEELS. I just can't even... Okay, so I am babbling like an idiot, because this book was just so incredible. Not quite a sequel per-say, but a companion novel to These Broken Stars, which revolves around the lives of Captain Lee Chase and Rebel leader Flynn Cormac. Destined as rivals finding the path as lovers. Sound familiar? Okay so it has some basic similarities to the previous novel, but the new setting, the new characters, the new situation all provide a completely different feel to the story. Action, betrayal, romance, confusion, deceit - it's a whirlwind adventure. So what about Tarver and Lilac you ask? Well, I can't really give too much away, but I can say they do make an appearance. Not quite the same if you got way attached to them in the first novel, but Lee and Flynn will capture you in the same way they did. Kaufman and Spooner have written yet another killer novel - together, they create worlds and relationships that are pure magic. 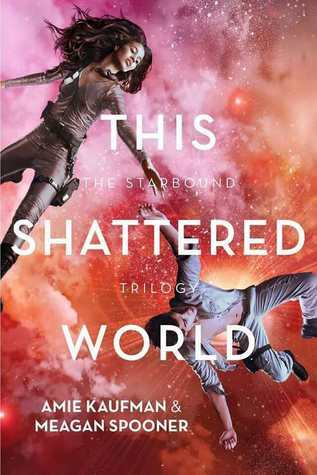 If you loved These Broken Stars, then you are going to fall in love again with This Shattered World. I would definitely recommend reading them in order, though the could be stand-alones, but there would be important things you miss. Plus, if you haven't read it yet I don't think we can be friends. The Good: Kaufman and Spooner are an incredible team and make you feel so many feels. Just as much love for this book as the first one! The Bad: Yet another wait for the next book! !